When I lead storytelling workshops, someone inevitably says their work or their business is too complex to capture in a story. 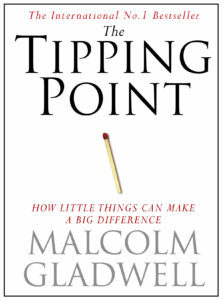 That’s when I point them to Malcolm Gladwell, author of Blink, Tipping Point and other bestsellers. I once watched Gladwell keep a ballroom full of people on the edge of their seats with an hour-long story about the Civil War. Now most of us can’t tell stories on his level, but there’s an important lesson to be learned from him and his books. He manages to explain complex sociological phenomena by bringing them down to a human scale and weaving them into enthralling stories. It’s a real art. Read any of his books and you’ll pick up a familiar pattern. In each chapter, he starts with a small detail, a slice of life, an average character, then he shows how it illustrates a larger principle, investigates that, and finally comes back around to his starting point, offering a satisfying resolution for the reader. I’d also recommend any of the works of Malcom Gladwell — Blink, David vs. Goliath. He and the guys who do the Freakonomics books have an amazing ability to take complex concepts and bring them down to a human scale and tell really interesting stories. And Gladwell’s response is, “I’m not writing for social scientists.” And indeed if he was writing for social scientists we wouldn’t be having this conversation because he wouldn’t be a New York Times bestseller. So however you might feel about Malcolm Gladwell and that particular issue, check out his books and see how he takes something big and complex and takes it down to a human scale. Everyone learns differently. Some people benefit from being told how to tell stories. If you need some lessons, check out my Easy Formula for Unlocking the Power of Storytelling.